Google revealed that a patch for Chrome last week was actually a fix for a zero-day vulnerability. 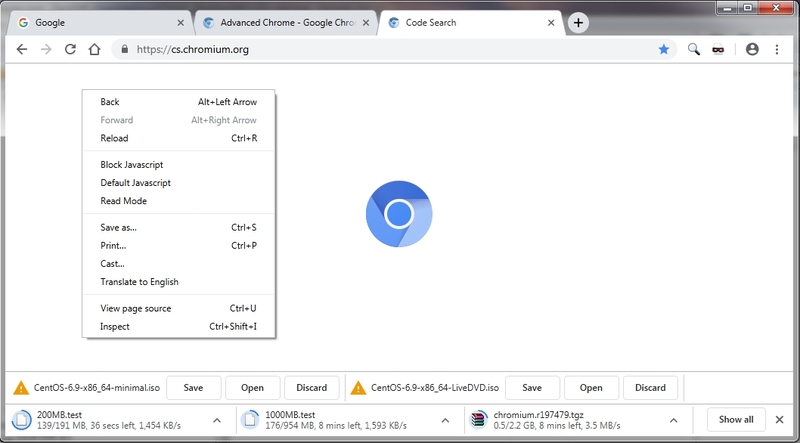 CVE-2019-5786 is a security flaw that Google described as a memory management error in Google Chrome's FileReader, a web API included in all major browsers that lets web apps read the contents of files stored on the user's computer. The vulnerable function is ArrayBufferResult() and has already been patched on Advanced Chrome. Custom Build is special since it contains a mix of different branches, mostly from chrome version 51 and some parts of versions 54 and 48. Not vulnerable versus Meltdown and Spectre. Built for stability and compatibility. Disabled Blurry fonts created by DirectWrite and Skia. Enabled NPAPI, this version runs JAVA and Silverlight. All Chrome stock features working. Build is almost stock but has important improvements. Features of this version are listed on top of this page. Save: Downloads to default folder or prompts user for location. Open: Downloads to temp folder and opens download when finish. Up to 999 downloads can be handled at the same time, they will stack and wait for user action. Full download info including speed, time left and size (18/300MB, 3 mins, 840 KB/s). Allows to store downloads that are only going to be opened. This folder is cleaned / deleted automatically when browser is closed. Press right click on background of the current page and click on read mode to simplify content, focus on text and remove ads. This is chromium build so your profile folder will be different than chrome profile. Fixed: Chrome PDF internal viewer shows blank document. Fixed: Enter key on omnibar not responding. Fixed: Downloads halt after clicking on "Show in folder"
Webpage read mode option located on right click menu. Protection versus Meltdown and Spectre vulnerabilities. Removed dynamic user agent, you can install Chrome UA Spoofer extension to change it. Open download asks for download location when "Ask where to save each file before downloading" is enabled. 05 - Dec - 2016 .- Updated Chrome DirectWrite analysis. Netflix can be run on HTML5 or Silverlight depending on user agent (you can download "User-Agent Switcher" extension).